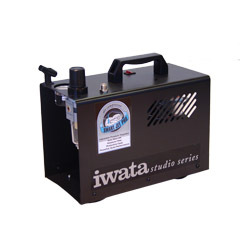 Intelligent Power: Featuring Iwata's Smart Technology, the Smart Jet Pro compressor is perfect for the occasional and professional artist doing general airbrush applications. It's powerful, compact, reliable and quiet. This is a non-stocked item; typical delivery times are one to two weeks from order placement. Please contact us if you wish to place an order for this item. This product was added to our catalog on Saturday 28 July, 2007.